Atomic to tectonic scale examination of crustal geometry, deformation, and evolution using seismic studies, field mapping, fracture analysis, petrography, and geochemical analysis. Some examples of current research by our faculty in Crustal Structure and Geophysics are shown below. Visit the faculty members' pages through the above links to get more information about research in Crustal Structure and Geophysics at UT. Bill Dunne and his students examine mesoscopic and microscopic structures in sedimentary and low-grade metamorphic rocks to determine regional tectonic histories and deformation behaviors. 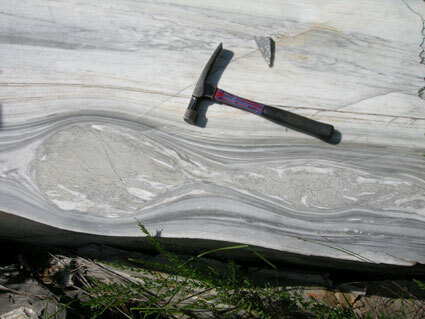 Specific problems that they are interested include: (1) development of blind foreland thrust belts; (2) formation of fault-related folds; (3) the overall contribution of outcrop-scale deformation to regional shortening; (4) low-temperature deformation of quartz arenites including diagenesis; (5) variation in shortening responses in a stratigraphic sequence as a function of lithology; (6) development of regional orthogonal joint patterns; and (7) improved characterization of joint patterns. The tools that Bill and his students use to tackle these problems include: (1) strain analysis, (4) small-scale geological mapping of features such as fault-related folds, joints on bedding pavements or cleavage distributions, (3) cross-section construction at both regional and outcrop scale including section balancing; and (4) one-dimensional and two-dimensional sampling of joint patterns. Robert Hatcher has been working to understand the mechanisms of emplacement of large thrust sheets in a high grade metamorphic terrane. Components of this project involve detailed geologic mapping in and southwest of the South Mountains and Brushy Mountains in North Carolina and areas in northwestern South Carolina, developing techniques to measure map-scale strain, and efforts to better understand the mechanical behavior of different components at all scales within ductile fault zones under different P-T conditions. The map left shows structure contours on the Appalachian Precambrian basement surface. Dr. Hatcher has been working to understand the mechanisms of emplacement of large thrust sheets in a high grade metamorphic terrane. 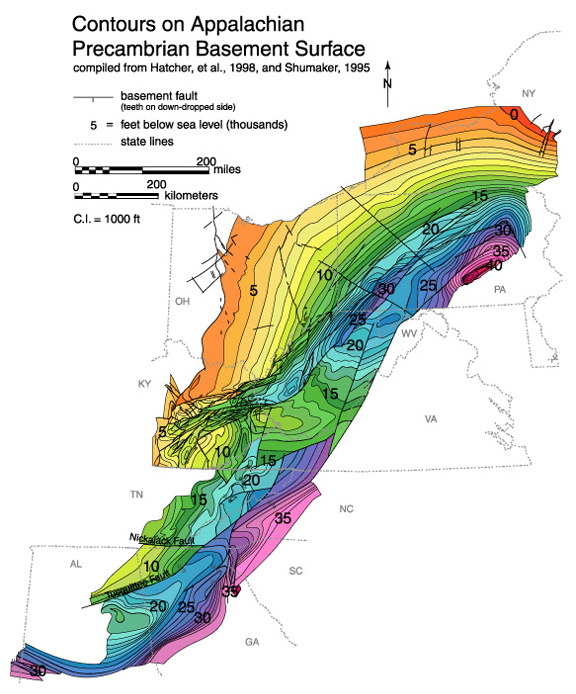 Components of this project involve detailed geologic mapping in and southwest of the South Mountains and Brushy Mountains in North Carolina and areas in northwestern South Carolina, developing techniques to measure map-scale strain, and efforts to better understand the mechanical behavior of different components at all scales within ductile fault zones under different P-T conditions. The map left shows structure contours on the Appalachian Precambrian basement surface. Micah Jessup's research interests in structural geology and tectonics range from mid-crustal flow to active tectonics. A common theme to his research is the spatial and temporal variability of strain partitioning at different scales and levels in the crust. Dr Jessup characterizes the transition from melt-present flow to solid-state fabric development and quantify the kinematic evolution of high strain zones. His research group is interested in granite emplacement mechanisms, timing and duration of melting, and the relationship between melting and rheology of the crust. Through international collaborative research, Dr Jessup's integration of his field-and lab-based specialties with thermochronology, geochronology and isotopic geochemistry test the evolution of orogenic systems.